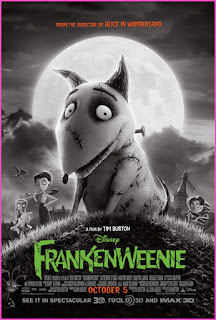 The majority of the reviews I have read of Frankenweenie have been preoccupied with the idea that it was not a return-to-form for Tim Burton... Well, here is the news. Tim Burton is not likely to "return-to-form" - he is simply a different filmmaker now, because it is no longer the 1990s. People grow and experiment. The cinematic landscape has changed. Frankenweenie should be judged in its own right as a film rather than as a "Tim Burton film that is not what the public wanted a Tim Burton film to be". As for Frankenweenie itself: the film is fun, but not life-changing. There were a couple of good laughs to be had (particularly with regard to the Sea Monkeys), but the film is not hysterically funny. Neither does it integrate the horror elements especially well. There are some quite forced references to Universal's Frankenstein, and even to Burton's own Batman, but neither adds anything to the film. In fact, they add to the sense that the film is superficial. The story is fine, if a little sentimental towards the end. In sum, it is all quite sweet, but little more. As an animated movie, it pales against the backdrop of Rango, Up, and Ponyo. In some regards, it even pales compared to Bolt. That said, if even one young viewer is encouraged to engage with more monochrome monster movies as a result of seeing this, then I am reluctant to begrudge the existence of Frankenweenie.